So, Lent – all 46 meat-free days of it – is done and dusted for another year, and I’m back on the good stuff. Or, at least, some of the good stuff; given how fond I was of vegetables already, there was never going to be any sort of Damescene moment at the end of this, tofu excepted (and I think that counts as only a partial conversion, although I do still have my chocolate tofu cake to make). 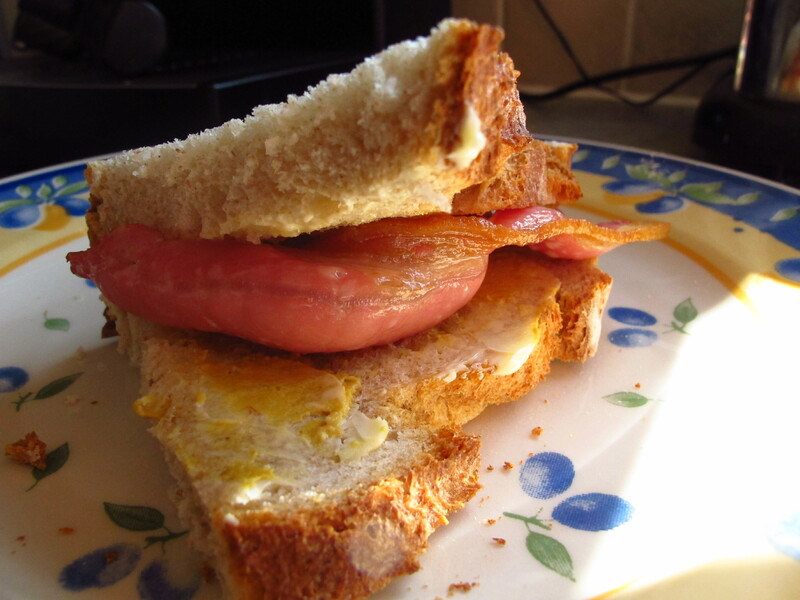 After running to the new Turner gallery at Margate and back in the Saturday sunshine with my brother and brother-in-law, we tucked into James Elliot’s dry-cured bacon on Kentish sourdough (transported to Kent, naturally enough, from St Pancras) with a generous slick of English mustard. It was gone in minutes, and it felt like I’d never been away. No angelic choirs, no crying piglets, just business as usual. 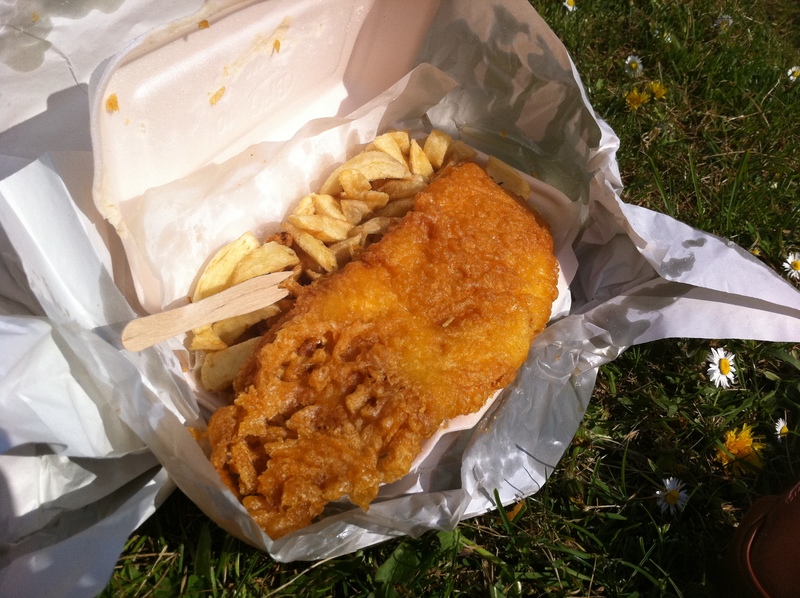 I had more time to reflect upon lunch – fish and dripping chips with heaps of salt in the sun in Sandwich: check out that cascade of crisp batter on the end (which later went to my nephew Harry). Dinner was smoked salmon, followed by my dad’s cassoulet: confit duck, sausage and yet more bacon – bliss. I didn’t intend to go on as I started, but thanks to some wedding on Friday, for the past couple of days I’ve been eating coronation chicken until it comes out of my ears, and I’m beginning to feel some vegetables are in order. Step in, new season asparagus (hurrah!). So, what have I learnt from the experience, apart from the (limited) acceptability of tofu? That there’s more than one way to cook green veg (although steamed then sauteed with garlic is still a winner). That aubergines can be steamed as well as fried. That Marmite is an acceptable substitute for anchovies in many, if not all, situations. And, most importantly, that I should be more adventurous in my everyday cookery. I don’t think that my eating habits will change significantly as a result, (although I am going to be firmer with myself when it comes to trying new recipes) given that I didn’t eat much meat to start with, but, after finally finishing Safran Foer’s Eating Animals on Saturday, I am going to make more of an effort to only eat meat I’m comfortable with. If someone invites me to dinner, I’m certainly not going to go through their bin to check the chicken is organic, but I won’t be buying any non-organic chicken or pork unless I know the suppliers (organic for me is more about the quality of life given to the animals, rather than the various chemicals involved). But what about the lamb kebabs which have been torturing me nightly as I cycle home through Dalston? Can one mistreat a lamb? And what about Byron burgers? They’re pretty damn tasty, but they’re not organic. I don’t, I’m afraid, have Safran Foer’s strength of character: I’m not willing to make that commitment, and that, I suspect, puts me in the same category as any common or garden fried chicken addict in his eyes. But it’s better than nothing.